I am so in love with this cake. 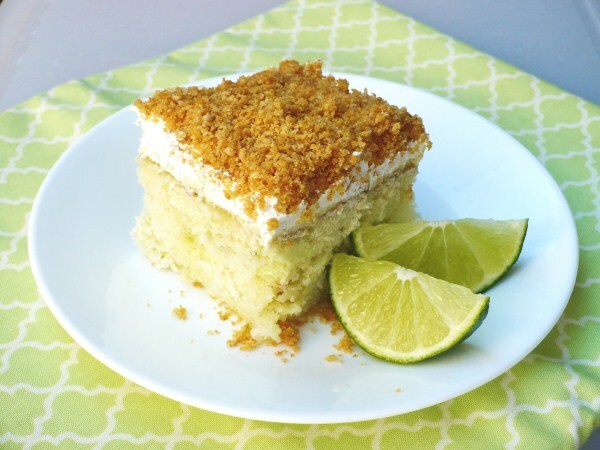 Of course I love anything with lime, especially key lime pie, and this cake is now in my list of favorites. It tastes light and refreshing and is a lovely change of pace from the typical pudding poke cake. Don't get me wrong, I like pudding poke cakes as much as the next guy, but this cake kinda puts them to shame. You'll need lime juice and lime zest. You'll probably be safe with 4-5 limes for the juice - just remember you'll also need the zest from 3 of them. Don't be a dolt like me and chuck them in the garbage after juicing only to remember, "Oh yeah, I still need those." Whoops. Now my fridge has a couple of naked limes. And to be specific, when calling for a graham cracker sheet, that means the whole graham cracker (all four sections). Preheat oven to 350 degrees for shiny metal or glass pan (325 degrees for dark or nonstick pan). Grease and flour bottom only of 9x13 baking pan. In a large bowl, beat cake ingredients with electric mixer on low speed 30 seconds. Beat on medium speed for 2 minutes, scraping bowl occasionally. Pour into pan. Bake 26-30 minutes or until toothpick inserted in center comes out clean. Cool 5 minutes. With handle of wooden spoon, poke holes almost to bottom of cake every inch or so. In medium bowl, stir together filling ingredients (mixture will thicken). Pour over cake; spread evenly over surface, working back and forth to fill holes. (Some filling should remain on top of cake.) Refrigerate at least 1 hour or overnight. Fold zest into Cool Whip and spread over cake. In a food processor (or whatever method you prefer), pulse graham crackers, butter, and sugar until crumbly. Sprinkle evenly over cake. Refrigerate until serving.